Yass Valley Council is adamant they will pursue a buffer zone at the state border. File photo. Yass Valley Council says its adamant that a proposed border buffer zone to prevent urban development along the Barton Highway will go ahead, despite significant pushback from the NSW government. That’s despite opposition to the buffer from some landowners who may have anticipated a development bonanza. NSW planners have rejected Council’s application for a 5km zone north of the ACT border where no development would be allowed. But Yass valley planning director Chris Berry, who has pushed hard for the idea, says it’s critical to prevent ad hoc urban encroachment spilling over the border. “But that’s never been the case for that area. Through our settlement strategy, we’ve established a gateway to Yass Valley. It’s an important rural landscape, and there are significant environmental values around Mulligans Flat that we would like to maintain and protect,” he said. Instead, Council plans to channel development and growth towards both Murrumbateman and Yass, which Mr Berry said were better positioned to take advantage of growth for Yass Valley. That will require infrastructure investment including a water pipeline from Yass, but Mr Berry says Council can solve the issues. Development in Yass town is also a priority over “urban suburbs strung out along the border”. The development exception is Ginninderry, where a unique and complex set of issues will arise from the Parkwood site straddling the border. The site can only be accessed from the ACT and Mr Berry says there is “some logic” in seeing the extensive development as a special case. That will require complex cross-border agreements between the ACT, Yass council and the NSW government, but Mr Berry points out that the impact of these is several decades into the future. If negotiations fail, Council’s fallback position would support a change in the border to incorporate the development fully within the ACT. “If we cannot make those arrangements work, we don’t want existing ratepayers in Yass, Murrumbateman, Gundaroo and Sutton to have to bear the costs of servicing that area,” Mr Berry said. The Ginninderry site also includes areas of significant conservation value, and Mr Berry said that current development proposals include a conservation area with a special rating mechanism for conservation purposes. A percentage of the initial sale price would go towards a sinking fund to manage the conservation corridor around Murrumbidgee river including fencing, weed control, pathways and walkways. There would also be a special rate applied towards ongoing management of the conservation reserve. Mr Berry says that while this arrangement would not offer the Ginninderry area the conservation status of a national park, it has the advantage of creating a dedicated and continuous income stream under the development agreements. Do you think we need a buffer zone between NSW and Yass Valley? Green belts are used in many places around the world for different reasons, including to maintain a separation between towns that might otherwise merge into one. 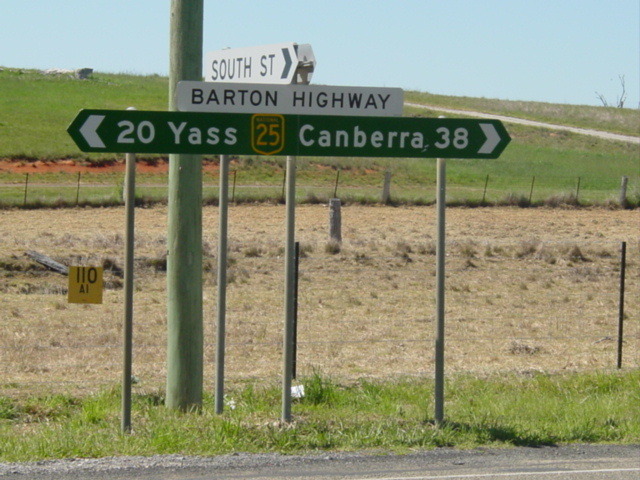 The Yass proposal will ensure that Yass town remains the identifiable centre of Yass Valley. It will also assist in conservation of wildlife by providing a wide and extensive corridor through the large urban area that will be the inevitable outcome of the expected huge growth in population. Properties within the green belt should be large enough to be viable for maintaining a green landscape with trees. I was fortunate enough to be able to submit a similar suggestion into the planning process for Ginninderry way back when to cover off our side of the ‘bidgee. It was shredded by the planners – I mean ‘absorbed’ into their plan. I think farming and undeveloped land in and around the area is doomed to give way to more high density urban Canberra sprawl - in the short to medium term until the housing boom crashes.